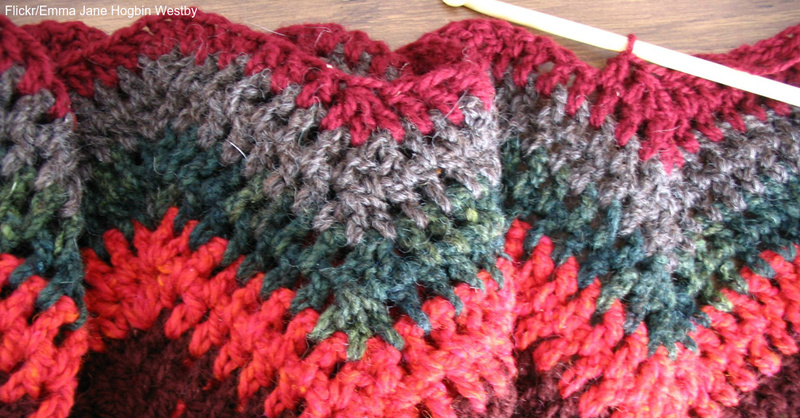 The half-double crochet stitch, or hdc, is highly varied and lies between the single smaller crochet and larger double crochet. This stitch lets you alternate colors, create amazing patterns, and turn several rows into double-sided pieces that look similar no matter the angle. Start by making several rows of 19 chains, and work the hdc into each chain three stitches from the end at the 17th chain. Yarn around hook, and insert the hook through the front and back loops of your next stitch in the previous row at the 17th chain. Yarn around hook to put three loops on your hook. Yarn around hook again, and pull through the three loops to finish the hdc. The key is when you go back three stitches from the end of the chain. The effect looks like an even, stable stitch throughout the tight pattern. When you first practice, start with a few rows of single crochet, and switch to hdc. That way, you can see the differences in the stitches as you progress. The final pattern alternates between two loops and a third loop. When you change colors from one row to the next, it looks as though the yarn has one stitch of the previous color and two stitches of your new color. No matter how you proceed, you need at least one foundation chain to start hdc stitches. You can create different textures depending on how you incorporate hdc. The standard texture occurs when you put the hook through one front and one back loop. A ribbed look occurs when you just use the back loop in the chain, which is perfect for sweaters, mittens and cuffs. Crocheting the front loop only has the effect of a Tunisian crochet, and this ribbed look is completely different from a back-loop variety. If you just use the middle loop in hdc, the appearance looks just like knitting. The reverse side of the middle-loop hdc has unique squiggle patterns that resemble small ocean waves. This knitted stockinette stitch, like every hdc stitch, is completely reversible. Once you perfect the hdc, your crochet technique is open to all kinds of new designs and patterns. This video offers an excellent look at how to perform the hdc as you create a knitted look.